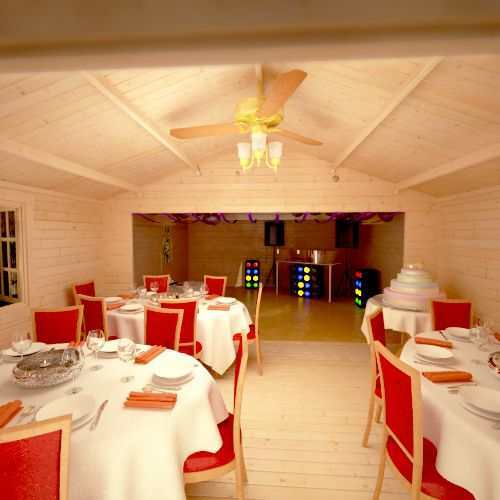 The Omega Log Cabin is currently the largest of the Tiger Log Cabin range we make as standard. The Omega is constructed with the highest quality 44mm pre-cut interlocking logs as standard. We needed a couple of alterations on the log cabin we wanted to order, spoke to the sales team at Tiger Sheds who were so helpful. 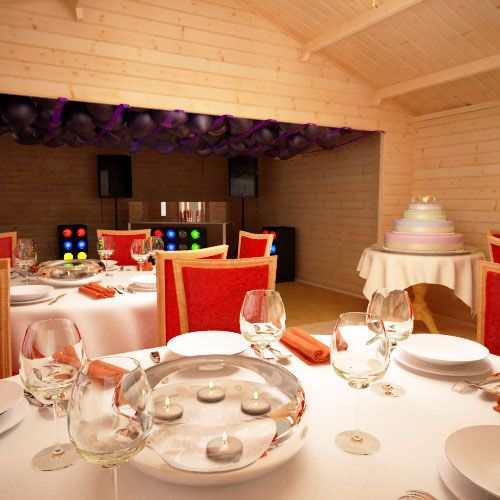 There was plenty of communication from the guys at Tiger Sheds so we knew at all times what was happening and when.The log cabin turned up on time with an installation team 'hot on their heals' and we couldn't believe how quickly they put it together. Everything fitted perfectly and the log cabin is now in full use. Altogether a great company and would highly recommend them! 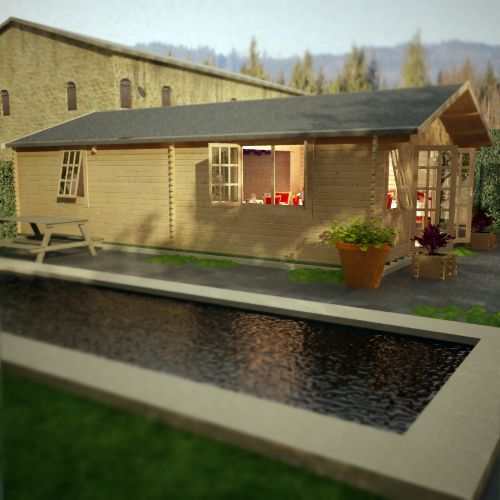 As our home is not that big, espcially with the children taking over, I was hoping to get a cabin which would be ideal to work and to make it into a gym. Once I came across this product I was very excited by the size and design at such a great price! I found the staff at Tiger Sheds very kind and patient, as I had a lot of questions and would like to say a huge thank you to everyone there! Over the years me and my husband have put a lot of effort and time into both our home and garden. 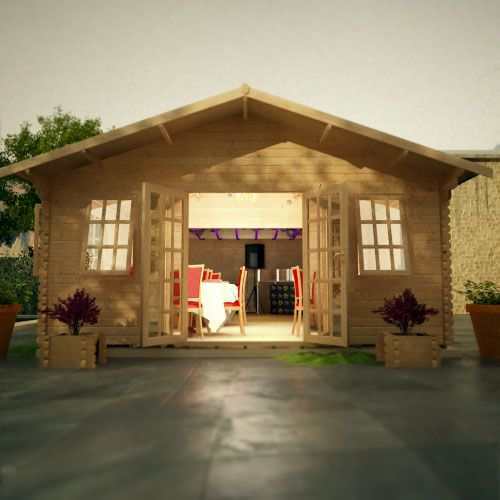 We've always wanted a log cabin but it was a matter of finding the right product! 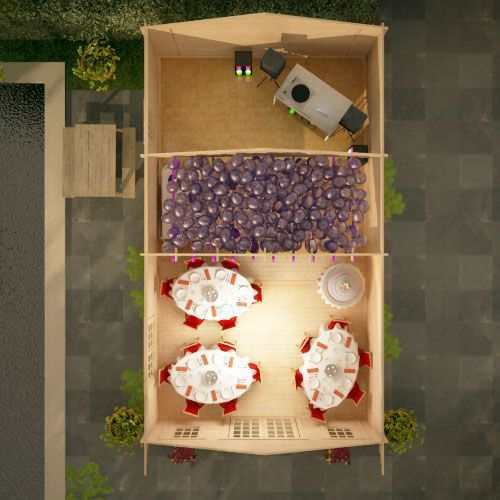 After searching through the Tiger Sheds website we decided we wanted a bigger cabin, something we could use for parties and essentially as an extra room to the house. 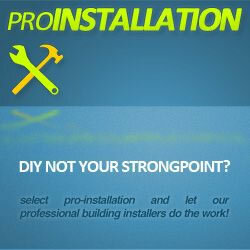 We have to say we're very impressed with both the service and the product. Great product and service! 5 for Tiger Sheds! Such a lovely product and it's huge!! I knew it would be big from the images but so happy with the size, design and quality. When you're spending money on a garden building you want to know it will last a while and with this product I'm very confident! 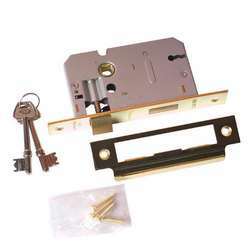 Excellent product and service! Have told all my friends and family about Tiger Sheds and would strongly advise others to buy from here!!!! 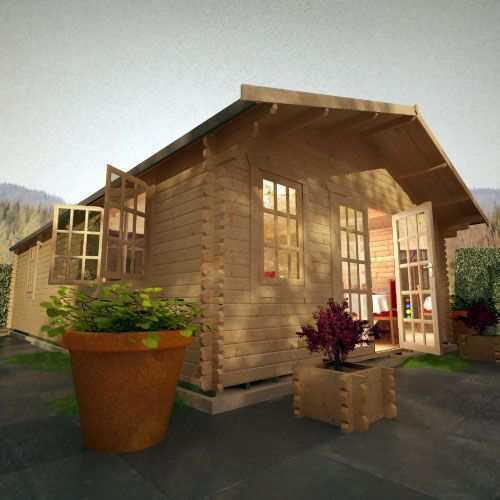 This is the phenomenal Omega 44mm extra large Log Cabin. 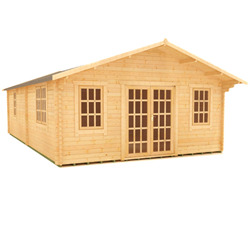 Due to our superior manufacturing techniques and years of manufacturing know how we are able to offer this super-sized luxury 44mm interlocking Log Cabin. The Omega features beautifully crafted double doors, three single windows and a gorgeous double window - all draft sealed for excellent heat conservation. 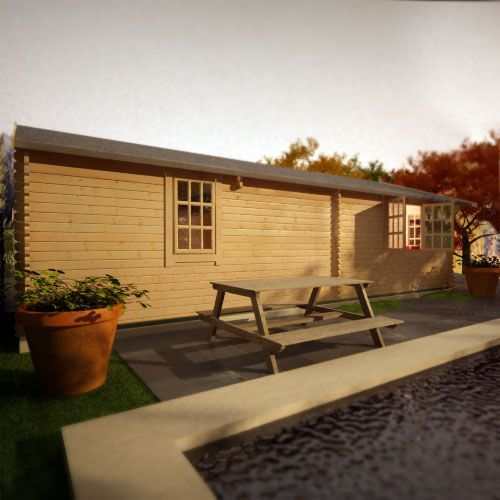 Like the rest of our Log Cabin range, the Omega is available with a great range of additional extras for your consideration. 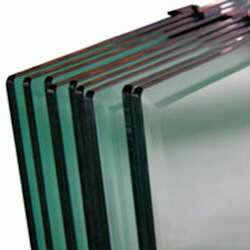 These include double and toughened glazing, as well as shingles and many more. 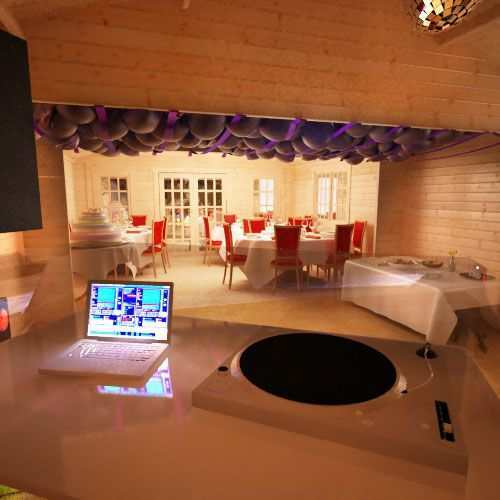 Please contact our expert sales team on 0113 205 4189 if you want this cabin in a bespoke size. OMEGA LOG CABINS feature high-grade 44mm interlocking planned and finished logs – beware of log cabins that feature rough edged boards machined from poor quality timber. OMEGA LOG CABINS feature a specially designed 4-way chamfered notch-joint system ensuring a tight fit to all boards with little room for damp or wind penetration – beware of log cabins that feature square cut logs with square notch-joint, often leaving a sloppy joint with large visible gaps. OMEGA LOG CABINS feature heavy duty green mineral roofing felt as standard, with the easy option to upgrade to premium quality roof shingles – beware of log cabins that come with no roof covering, leaving the cabin completely open to the elements. OMEGA LOG CABINS feature oversized extra large doors and windows – most competitor log cabins use narrow doors which can prove difficult for access. OMEGA LOG CABINS feature high quality glazing which is factory siliconed and internally beaded to all windows – beware of log cabins that feature lesser quality materials and provide no window beading. OMEGA LOG CABINS feature a generous all round roof overhang which protects the building from severe conditions – beware of log cabins with little or no roof overhanging leaving them vulnerable to the wind and rain.